You are here: Home > Blog > Flora & Fauna > Scots Pine, fire, and capercaillies. 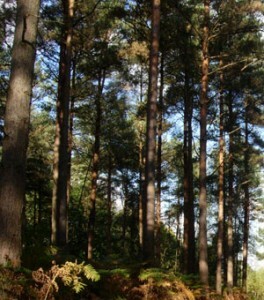 Scots pine and natural pine woodland has a wide distribution in the Northern Hemisphere (it stretches from Scandinavia to southern Spain and from Scotland to Siberia). It is home to a number of special species, like the capercaillie or wood grouse (the males are strongly territorial and engage in a distinctive mating display). However, in some pine woodlands the structure and composition of the understory / shrub layer changes over time so that heather comes to dominate to the detriment of the blueberry (Vaccinium ssp). The blueberry is also known as the bilberry, or in Scotland blaeberry (blae = blue), whinberry is a local term - as they tend to grow amongst gorse (whins) . Blueberry is the name often used for the cultivated form. The blueberry is an important plant in the life of the capercaillie. Berries for the capercaillies in the Autumn months. One management technique that is being investigated is fire. Fire is known to be an important natural agent in the maintenance of a mosaic of pine trees and woodlands across its geographical distribution, and localized burning of heather has been known to help blueberry regenerate and become more productive. The flames and heat can scorch the crown, so that the leaves are dmaged or killed. Photosynthesis is impaired or reduced and the tree cannot produce the sugars, starches and cellulose that it needs for growth. The heat can penetrate the bark destroying the cambium. The cambium is a layer of dividing (meristematic) cells that generates new conducting tissues – xylem and phloem. 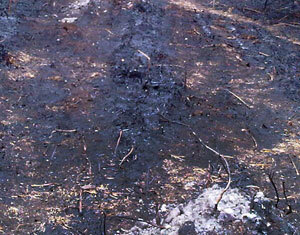 The burning of moss and litter can result in damage to the roots so that water and mineral uptake is impaired or halted. Fire in woodland (of any type) or indeed moorland is a dangerous tool. Nevertheless, research through various historical documents indicates that natural fires occur in such woodlands in the region of every 80 to 100 years, probably ignited through natural lightning. This is possible in areas like the Eastern Highland, where the semi-continental climate can result in short term droughts thereby creating conditions ‘favourable’ to a fire. 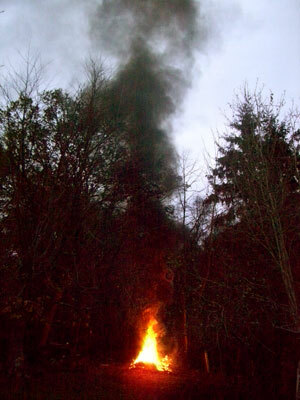 Controlled burns can successfully change the structure and composition of the shrub layer. This leads to an improvement of the habitat for capercaillie in pinewood areas. The environment for the blueberry improves, through the removal of much of the heather without damage to the blueberry/ bilberry underground stems and shoots (damage to roots of blueberry / bilberry and trees was limited by creating fires whilst the mosses / litter layer was wet. The moorland fires at Abernethy Forest Reserve were undertaken in open moorland / shallow peat areas where Pine has great difficulty in establishing itself. After the fires, pine seeds were distributed in the fired areas (and control zones) and percentage seedling establishment determined. The burnt areas had more than treble the number of young seedlings of the control areas, largely due it is thought to the removal of heather (and moss?). Such a technique might allow Scots Pine to colonise new areas of moorland. It is possible that with further research that the present prescription on the use of fire in Scottish pinewoods may be re-evaluated. Great article to sum up the effects of fire on woodland: especially timely following a conversation I had last night!